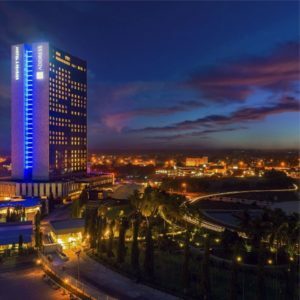 Emaar Hospitality has acquired management of Togo’s first class hotel, Hotel 2 Fevrier, under a deal signed with Kalyan Group, which owns the business occupying the Sub-Saharan country’s tallest building. UAE group’s premium lifestyle hotel and serviced residences brand, Address Hotels + Resorts will take charge of the entity under Address Hotel 2 Février brand, Arab Business reports. The signing came between Olivier Harnisch, CEO of Emaar Hospitality Group, and Ashok Gupta, CEO of Kalyan Hospitality Development Togo, and founder and CEO of Kalyan Group. “Togo is strengthening its tourism sector with the goal of increasing the share of the industry from 2 to 7 per cent by 2020. It is investing in infrastructure upgrades and boosting the industrial sector,” Harnish said. Hotel 2 Fevrier, built in 1980, is located in the center of the Togolese capital and offers bird-fly view of the entire city and beyond. Address Hotel 2 Février will have 256 rooms and suites and 64 serviced apartments as well as an array of themed restaurants, meeting venues and other attractions. The foray into Togo is the first in Sub-Sahara by the Emirati group. The hospitality group is looking to expand to Saudi Arabia, Egypt, Turkey, Bahrain and The Maldives where it is working on hotel projects. Emaar in already present in 5 countries around the world, including the UAE where it has new openings.